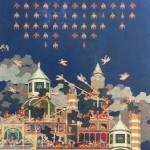 Game Over by Dan Hernandez is his fourth solo exhibition at the gallery. The artist presents a skewed interpretation of mythology, religion, and violence, enlightened by popular culture and current events. He blurs boundaries, rearranges hierarchies, and questions our notions of iconography and devotion. Genres from the recent and distant past merge with apparent ease. 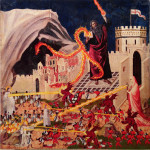 The show’s title Game Over references our political climate enlightened by the artist’s toy box obsession with video games, early Italian art and religious iconography. Saints, angels and even the hand of God appears as a requiem for deceased carnage. Giant iconic figures provide inspiration towards a greater good against our numerous adversaries. Supreme beings are transfigured into radiant glory. Characters from video games merge seamlessly next to Botticelli’s illustration of Dante’s Inferno. The artist’s epiphany was the realization that the iconography of early Italian art and emerging 80s pop video game culture shared stylistic and narrative qualities. 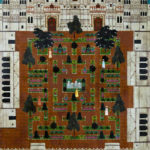 Flattened space and exaggerated differences of scale were characteristics of Byzantine art, but they are also at home in early Sega Genesis video games. Inspired by the flat pictorial plane and iconic figures, Hernandez creates epic battles between religious and fictional characters that mockingly pictorialize our current braggadocious rhetoric. Hernandez was awarded the Ohio Arts Council Individual Excellence Award in 2011 and 2015. His artwork was included at Beit Ha’ir Museum in Tel Aviv, Israel “Immersion,” Southern Ohio Museum “Fast Forward to the Renaissance,” “Bad For You” curator Beth Rudin DeWoody in London, Lehman College Art Gallery “Under the Influence: the Comics,” Westport Art Center “Toy Stories” curator Helen Klisser During. Hernandez received 1st Prize at the Annual Chautauqua Exhibit of Contemporary Art in 2013 and 2010. His work has been written about and reproduced in publications in France, Germany, England, Israel, Austria and the US including in ARTnews, Hyperallergic, Spiegel Online, Gizmodo, and Arte Fuse.